Here is finally our interview with Paula Powered in our punk news coverage. A punk music band located in France. They put all of their efforts in giving the little extra by having their Amiga 1200 on stage and so Amitopia, that is part of Distrita website now, got interested in having a few answers from them. So here are our questions and answers about this very interesting band named Paula Powered. 1. Where do you come from, who are you and who is part of PAULA POWERED? PAULA POWERED currently lives in France, about 100kms from Lyon. We describe ourselves as a British-French-Digital trio: I’m (Sally Ann) British (originally from London) and am the voice. Sylvain de St Pierre is French and looks after all the programming, arrangements as well as the guitars. Our digital member is A12: an Amiga 1200 who provides the basis of our music and also manages the images that are projected during our concerts. 2. How did PAULA POWERED come about? Sylvain and I started working together in 2007 – mainly on his solo French chanson project. In 2009, we decided that we wanted to make music together and started to research the type music we could make. Very quickly we decided we wanted to mix my British voice with his guitar and an electronic vibe. We wrote lots of demos and experimented with sounds and compositions before we found what we were looking for. Our first PAULA POWERED song “Hazy Crazy” was written very quickly during the Christmas break in 2010: It was THE song that helped us define our sound and we haven’t looked back since! Back then, we didn’t even have a name! 3. What type of music do you make? This is the question that is always so hard to answer! We call our music Digital Punk (yes, we invented our own “label”!!). The way we describe it: PAULA POWERED brings the 80s retro sound into the 21st century with songs where punk, pop and electro are mixed with old video game sounds”. Our musical influences are extremely diverse and varied and this can be heard in our music. When people hear our music for the first time, I’m always fascinated to hear their reactions: Everyone is reminded of something – an artist, group, memory, genre. Often after shows, people come up to us and say “I don’t normally listen to your style of music …. but [insert: nice, positive feedback]”. Which is good!! 4. How did Amiga as a computer find its way into your tones or was it with you since the launch of PAULA POWERED? By complete accident! When we were researching what equipment we needed, we didn’t have the money to invest in lots of new material: We needed to use what we had. Sylvain lifted the dust sheet that covered his Amiga 500 (previously only used to produce samples), launched OctaMed and started composing. A few hours later “Hazy Crazy” was born. Within days, we had three more songs! BINGO! The “something different” we had been struggling to find was found. 5. Have you played any concerts? And if so, tell us where you have been? We’ve been playing concerts since the very beginning. Our very first concert was for an Amiga meet-up called “Amigatêries” in France. 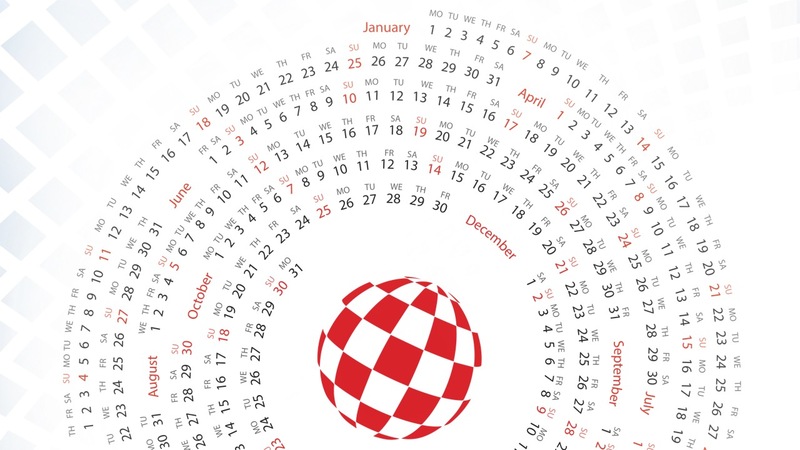 We contacted the organiser HunoPPC (or Amiga Godfather as he is known in France) at the beginning of 2011 for some advice regarding our Amiga. As soon as we described our project, he got all excited and invited us to play for his collectivity a couple of months later. At the time we only had four “playable” songs so we quickly composed a few more. I think our first set lasted about 20 minutes. Since 2011, we have played at other French demo parties including: L’Alchimie (TripleA) and VIP (Popsy Team). This year, we played at our first retrogaming event: Nostalgeekend. Playing for the demoscene and the retrogaming scene is very important for us. The public already has an affinity for the “sound” we produce and, more importantly, the two communities are made-up of the nicest people you can meet! 2014 saw us make our first tentative steps into the “real” music world and since then we have played in numerous “conventional” music venues. Our first big concert was in October 2015 when we played in front of 500 people! Next year should see us playing in places we’ve never been to – even as visitors! 6. Do you have any plans for more concerts? And if so, will you play outside of France? We are constantly looking for opportunities to play – but it is the part of being a musician that we hate the most! In fact 95% of the concerts we’ve done to date have either been because someone called us or as part of an amateur music competition. So, if anyone wants us to play for them … get in touch! Playing outside of France? With pleasure!! The only things holding us back are our completely old and battered 306 and a major lack of travel funds. We had hoped to play at some of the 30th Amiga anniversary events outside of France, but the travel costs were too inhibiting for us and the organisers. But, we WILL find a way! The GOOD news, for those who are too far to come and see us play, is that we are part of the French BIM!2016 festival: Two of our live gigs will be broadcast (sound only) via www.lesondier.com : an independent start-up platform that aims at bringing live concerts direct to your PC in real time. In fact, the “live session” that was broadcast on Amitopia TV on Saturday (1st October) was filmed as part of BIM!’s promotional campaign. 7. Who do you target? The logical answer to this question would be “geeks”, “Amigans”, “retro gamers” and “Chiptuners”. We have been very active in the online communities associated with these groups so it’s only normal that our statistics show that the majority of our audience is male, 35+ with over 130 nationalities represented. However, we have now played a large number of concerts for diverse audiences and we have found that our music speaks to a large cross-section of the population. For example, our lighter’s mum came to one of our open air concerts and she has very traditional tastes, her reaction was “I really enjoyed the concert. I’m not sure I’d listen to this at home, but they’ve got a lot of energy!”. Recently, I worked with teenagers at a beauty school – I was their “on-stage make-up” project. During our sessions, I played PAULA POWERED and they now all have our sticker on their workbooks and many have “liked” our Facebook page. Basically, we don’t have a specific “target” in mind when we compose … our aim is to get our music out there and we’ll just wait and see what happens! 8. 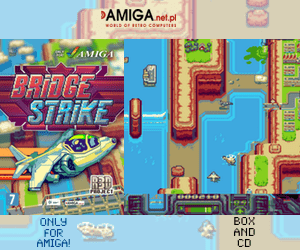 How do you use your Amiga together with rock? What tools do you use? A12 is our backing band – he provides all the additional instruments we need to have a “band” sound. OctaMed is our tracker of choice and we also use DPaint and Scala for the creation and transmission of images and animations. 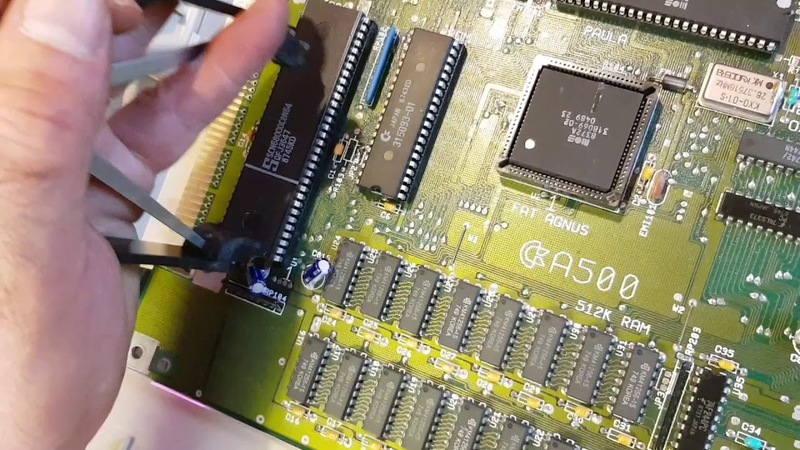 The simplicity yet multi-tasking abilities of the Amiga make it, for us, our instrument of choice. The soundcard (Paula) plays a fundamental role in shaping our sound. For the last few years our principal Amiga has been an A1200 as we needed the midi function. The way we have used our A1200 has evolved over the years. At the beginning, we sent solely 2 x mono channels to the main mixing desk. These two channels included all the “instruments” created in OctaMed: Drums, percussion, keyboards, samples etc. In order to create a greater sound dynamic, we then used two A1200s in parallel: The second Amiga was attributed as slave to the primary machine and was effectively used as a sampler. Thus allowing us to send 4 x mono channels to our sound engineer. However, this still limited the “punch” of our sound when played on large sound systems. Our sound engineer wanted “more” separate channels. So, Sylvain did some research and integrated an AKAI S5000 to our setup. The S5000 acts as a sampler that is managed by OctaMed and means that we now send 10 “Amiga / AKAI” channels to the main mixing desk. The following sounds are divided into single channels: Kick; snare; hi-hat; tom; cymbals and percussion; synthesisers (multi); samples. Why? Basically, because this allows the venue sound engineer to have more control over the sound that comes out of the speakers ie if the kick is too loud, it can be turned down without affecting the volume of the rest of the drums. This configuration also gives us a more powerful, more rounded, more coherent “live” sound. A couple of years ago, we added images / animations created in DPaint. These are loaded into a Scala script and launched via OctaMed with embedded rexx commands. At our shows, these images are projected behind us. 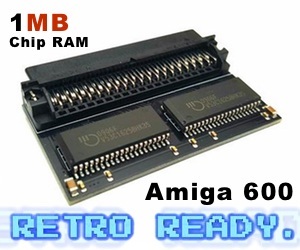 We are currently looking into ways of exporting what’s happening on screen in order to create “Only Amiga” videos. I sing and have chosen to use a simple SM58 microphone to keep the vocals sounding “raw”. Sylvain uses two guitars: A Fender Jaguar and a Gibson SG. He has a very small 4-watt Vox amplifier picked up by one or two SM57 microphones which allows the guitar line to mix in with the Amiga and the voice – making us all blend nicely together to create a combined universe. In our home studio, we use this same setup and Logic Pro on our Mac to record and mix all the channels. 9. Any final words about where you are going in the next 10 years? The one thing that is totally sure, is that we will continue making music for as long as we possibly can! The rest is going to depend on many unmanageable factors such as luck! To be honest, we do not aspire to be big international rockstars (we like the simple life), but we hope that our music will eventually take us to countries that we can only dream of visiting at the moment! Our principal hope / dream / motivation is to be able to live solely from our music and be in the position to employ a team: Technical and business. At the moment, the two of us do practically everything ourselves – cos, let’s face it A12 isn’t very autonomous nor able to manage our communication campaign. However, we are blessed as we have an entourage of talented, wonderful and generous individuals who help and support us on a voluntary basis (from graphics, videos, technical support, translations etc etc.). 10. Anything you want to say in the end? I suppose this is where I plug our stuff?!!! Thanks to a generous supporter (all to be revealed very soon), we have secured the funding to release our first ever self-produced CD! So, we are currently putting the final touches to the 5 featured tracks and the artwork and hope to have it ready by mid-November. Each of the tracks has / will have an accompanying video – including the Shoot !t live session filmed for BIM! Thanks for having us and we look forward to doing more wicked stuff with you!! !